for all of Rome to enjoy. honor, pride and the grand champion title are all at stake in the exhibition. Although lives will be spared in the arena, the same will not hold true at the festivities. the guilty from the guileful. Was it the brute in a fight for his freedom? A senator unwilling to award another seat? A socialite who will not accept a rising of the classes? Or perhaps a slave whose secret runs so deep that murder is the only way to silence it. that is, unless the murderer is you! Born into the upper class, Justice is not one to open the Senate doors, or his understanding, to those from different classes or families. Wealth and prestige have always come easy to this woman of privilege. What will she do when her power and dominance are in jeopardy? With an open heart and an open mind, Marcus proves to be a different type of leader, but whether he is one that will prevail and retain his Senate seat is yet to be decided. With a troubled past, this diva has made it into the upper class not through her money, but by her romantic exploits. Aspiring to be just like his father, Cicero may be following in Marcus’ footsteps in more ways than one. With his sights set on the Senate, Felix needs to capitalize on his popularity with the people, as well as prove that his managerial skills extend beyond the arena. 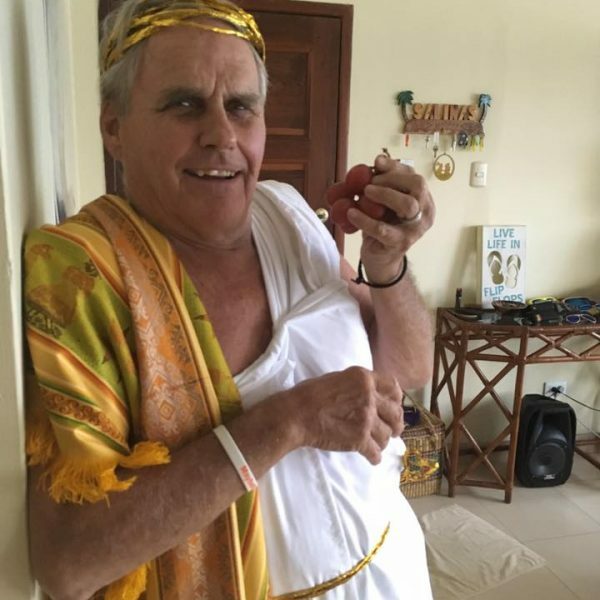 Toga, Stola, Chiton – it’s all Greek to me! 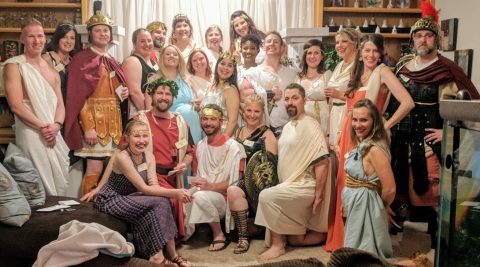 Find out how to make (or order) the perfect costume for your Roman night of mystery and madness!!! Costumes - Making your own! 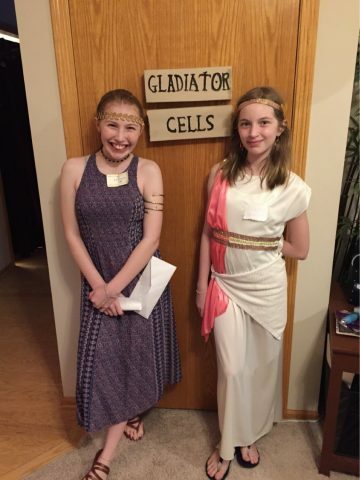 THE GOOD NEWS: Roman clothes were very easy to make and to put on. They were usually just made from a single piece of rectangular material, with no special shaping and very little sewing. Let’s begin with making your own outfit! Benefits: cost and originality – no one will have a costume the same as you! Look for bedsheets on sale, at discount or second-hand shops. Don’t like the color of your inexpensive sheets? Buy some fabric dye (approximately $3) and change it to a color you prefer. Buying yardage of fabric can be less costly (and more original) than purchasing new bedsheets. Look at the fabric store for gold tassels, cords, etc. to use as embellishments. Don’t know how to sew? You can use pins, stitch withery and/or a glue gun for the construction of most outfits. The basic item of male dress was the tunic, made of two pieces of undyed wool sewn together at the sides and shoulders and belted in such a way that the garment just covered the knees. Openings for the arms were left at the top of the garment, creating an effect of short sleeves when the tunic was belted; since tunics were usually not cut in a T-shape, this left extra material to drape under the arm. Men of the equestrian class were entitled to wear a tunic with narrow stripes, in the color the Romans called purple (although it was more like a deep crimson), extending from shoulder to hem, while broad stripes distinguished the tunics of men of the senatorial class. 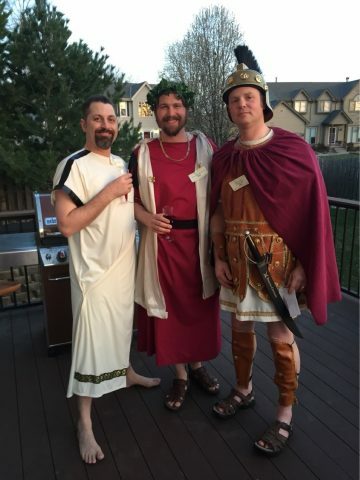 The toga was the national garment of Rome and only male citizens were allowed to wear the toga. It was made of a large woolen cloth cut with both straight and rounded edges; it was not sewn or pinned but rather draped carefully over the body on top of the tunic. Over time, the size and manner of draping the toga became more elaborate. The cloth was folded lengthwise and partly pleated at the fold, which was then draped over the left side of the body, over the left shoulder, under the right arm, and back up over the left arm and shoulder. It was held in place partly by the weight of the material and partly by keeping the left arm pressed against the body. Togas were costly, heavy, and cumbersome to wear; the wearer looked dignified and stately but would have found it difficult to do anything very active. 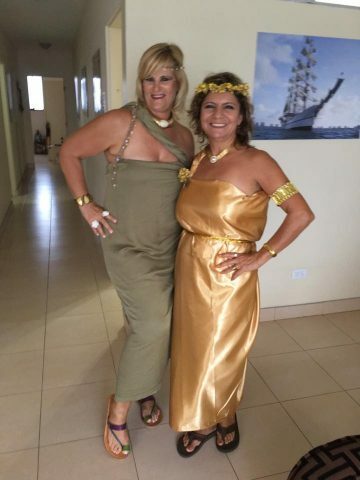 Citizens were supposed to wear togas for all public occassions. Think this one is un-makable? 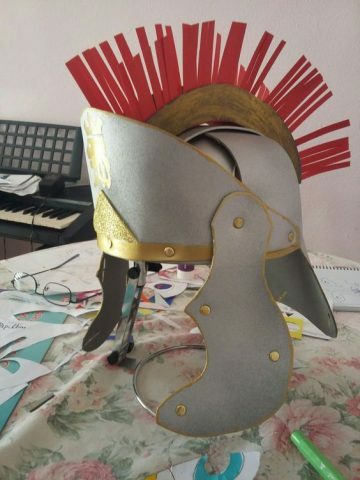 We found this AMAZING tutorial of how to make a Roman soldier costume out of cardboard! Check it out here! Inspiration. 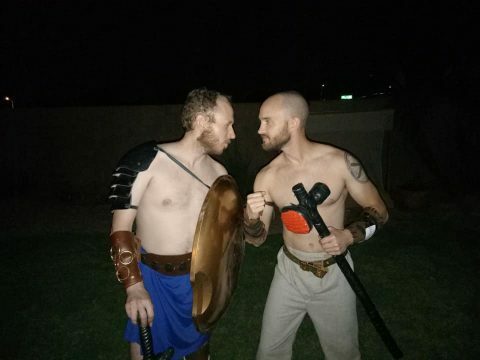 Search on the internet for an image of a gladiator that you would like to portray. You can find many gladiators in the Hollywood world from Russell Crowe’s Gladiator, to Kirk Douglas’ Spartacus, to any one of the gladiators in the Starz Series Spartacus. Once you have that image of what you would like to create, go about collecting things that would help you create it. Be it, old belts, fake leather straps, old sports pads, spray paint, hot glue, etc. And check out the tutorial on how to make a weapon for your night! Footwear can be a simple sandal or leather slipper that you have in your closet. This was very tpical of the time and would suit your outfit wonderfullty. OR, you can go all out and find some fun and funky Roman style shoes. • How to create Roman Sandals from scratch! Similar to Roman men, the basic item of clothing was the tunic, though women’s tunics were fuller and longer, usually extending to the feet. There were two basic styles of tunic, both similar to tunics worn by Greek women. The peplos was made from two rectangular pieces of cloth partially sewn together on both sides; the open sections at the top were then folded down in the front and back. The woman pulled this garment over her head and fastened it at her shoulders with two large pins, forming a sleeveless dress; she then tied a belt over or under the folds. FInd more info here. The more common sleeved tunic worn by women was similar to the Greek chiton. Two wide pieces of cloth were sewn together almost to the top, leaving just enough room for armholes. The woman pulled this garment over her head and used several pins or buttons to fasten it at intervals over her shoulders and arms, forming a dress with sleeves which could be belted under the breasts, at the waist, or at the hips. The length of the sleeves was determined by the width of the cloth. Statues clearly show the manner of fastening the sleeves as well as various modes of draping and belting the tunic. Tunics could be brightly colored or made of lightweight fabrics such as linen or silk. FInd more info here. Here is a GREAT blog on making a chiton. Click here. Roman women were simple in dress, but elaborate in hairstyle. Often if their hair was not thick enough for the current hairstyle, a woman would wear a wig. Red and blonde wigs were very in fashion. Use false hairpieces to make hair longer, curlier or thicker. Hair up: carefully arranged with jeweled hairpins to hold it in style. Feeling fancy? Check out these great examples of ways to adorn your head the Roman way! 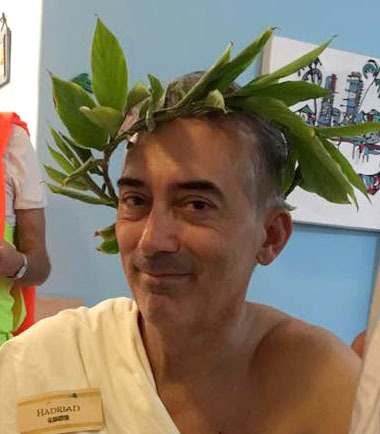 Let’s start with the basic — a laurel wreath goes with any Roman outfit! DIY on how to make one here!!! 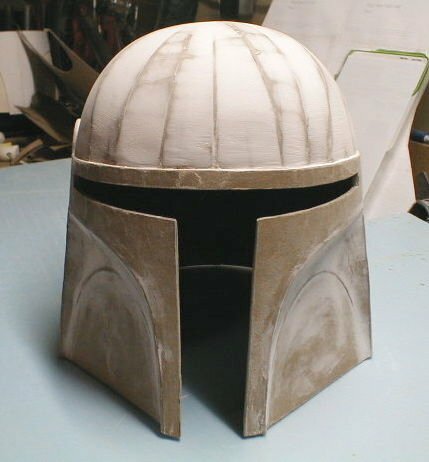 OR, CREATE A HELMET FOR THE EVENING! 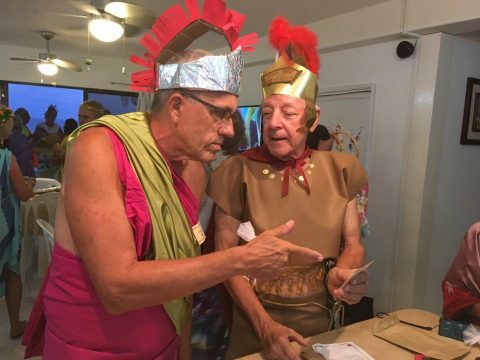 More information and resources on the Romans and the other party guests! Get the lowdown on the other party goers! Click here. See the Costumes Tab above!!! An informational piece on what it was like in ancient Rome. Click Here. Salutations! Gratitude! Apologies! 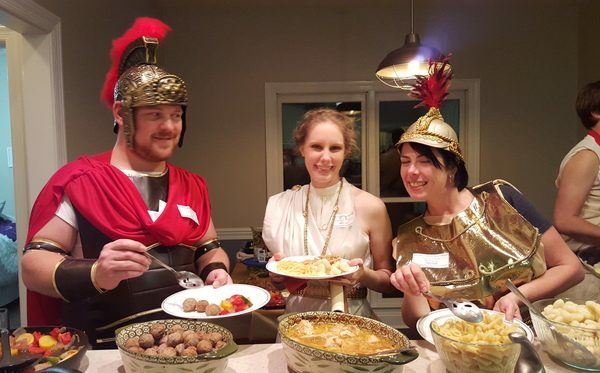 Download this list of words and phrases to help you speak like a Roman the night of the party… and decode what others are saying to you. Why were Romans called Romans and not Italians? Romans were Italians – end of story. However, a Roman looked down on mere Italians, as Rome was totally dominant in its sphere of Italy. As usual winners, Romans considered themselves as dominant, and even though eventually the other Italian peoples and cities were allied to them, they did not treat them as equals – Romans had superior legal rights, and exploited them too in commercial dealings with their allies. It was a close run thing, and when they eventually scraped home, Rome learnt and extended Roman citizenship to all its Italian allies, who, while Italians too, also became Romans. Roman citizenship was gradually extended to other ethnics as the empire expanded. By three hundred years later, all peoples in the empire were given Roman citizenship and became Romans, whether they were Latins, other Italians, Greeks, Gauls, Britons, Spaniards, Syrians or other ethnicity. This class was political and dominated by nobles whose ancestors included at least one consul. This class was based on economical standards. One could formally be enrolled in this class based on his stable minimum amount of money and could only be elevated if elected into the Senate. This was seldom and hard to do. Commons: All other freeborn Roman citizens. Latins: freeborn residents of Italy and of certain other Roman municipalities who had some legal rights but were not full Roman citizens. Foreigners: all other freeborn men and women who lived in Roman territories. Freedpeople: men and women who had been slaves but had bought their freedom or been manumitted. They were not fully free because they had various restrictions on their rights and owed certain duties to their former masters, who now became their patrons, but they could become citizens if their former masters were citizens and they had been formally manumitted. Slaves: slaves were born into slavery or sold into slavery through war or piracy. Slaves were the property of their owners by law, but by custom some slaves (especially urban, domestic slaves) might be allowed their own savings with which they might later buy their freedom, or their masters could manumit them, so some mobility into the previous class was possible. 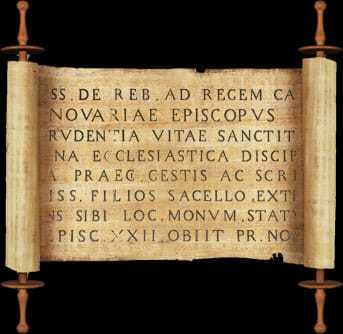 It was the public opinion of an individual that dictated a Roman’s worth. Because of this, of this, good deeds were rarely done unless the deed could draw much attention and praise. With public judgement was king, Romans tried to elevate themselves in the eyes of their peers in order to climb the social ladder. Any achievement by an individual was blatantly bragged about to make absolutely sure everyone knew of their good deeds. 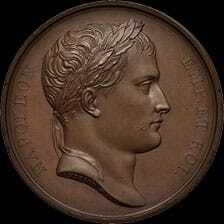 Citizens who wre too dignified to do the bragging oneself, simply found others who would boast for them. The credit a Roman gained among his peers was immediately used to advance their political fortunes; all in the hope of finally achieving that distant goal – a seat in the Roman senate. MORAL OF THE STORY: In Rome, where nobility, military and political leadership were all intertwined, there was no end of bragging, showing-off and a boundless supply of flattering rumours. So should it be at your party. More on the Gladiators and their Games! GLADIATOR OATH: “I swear to be burned, bound, beaten, or die by the sword in pursuit of honour in the arena.” Learn it. Love it. Repeat it at the party for kicks. As the contests became more organized, gladiators became more specialized. 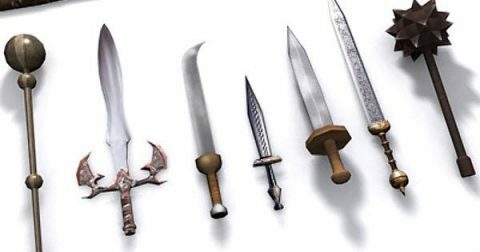 There were five types of gladiator, each with their own unique weapons. The Mirmillones were heavily armed and wore helmets decorated with fish. Thracians carried just a shield and scimitar, making them much quicker on their feet. The Retiarii were armed with just a net, a long trident and a dagger. Samnites had a sword, an oblong shield and a helmet with a visor. The Bestiarii fought wild animals. Which type of gladiator would you be? At least one emperor ordered his guards to toss unsuspecting spectators into the arena, for various reasons. The victim may have previously angered the emperor. Or, the victim may have been a complete stranger but the emperor disliked the way he was behaving in the Coliseum of Rome. Sometimes the emperor’s motive was simply to amuse himself by randomly selecting a spectator to meet his death in the arena. Commodus was the only emperor to fight in the Coliseum of Rome, which he did many times. He killed but was never killed. His matches were rigged by selecting opponents who were under-armed, poorly skilled or physically impaired from previous fights). He is the person portrayed as the malicious emperor in the Academy Award winning movie, Gladiator. Spectators were seated in the Coliseum of Rome by rank, social class and gender. The emperor had his own “court side” box. Senators were allocated choice ringside seats. The rich & well-connected had the next best seats. Male commoners (the largest audience segment) sat behind them. Women were relegated to the upmost tier – except for those trying to survive in the arena. 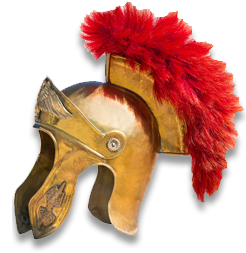 If a gladiator earned a reputation for fighting well and bravely in the Coliseum of Rome, the roaring crowd would implore the emperor that he be liberated. If the request was granted, the gladiator was handed a wooden sword, signifying that he was a free man and would never have to fight again. Chariot Racing was one of the most popular ancient Greek, Roman and Byzantine sports. Chariot racing was often dangerous to both driver and horse as they frequently suffered serious injury and even death, but generated strong spectator enthusiasm. 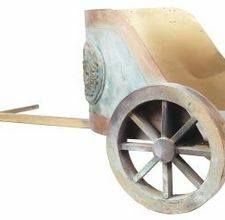 In the Roman form of chariot racing, teams represented different groups of financial backers and sometimes competed for the services of particularly skilled drivers. These teams became the focus of intense support among spectators, and occasional disturbances broke out between followers of different factions. The conflicts sometimes became politicized, as the sport began to transcend the races themselves and started to affect society overall. This helps explain why Roman emperors took control of the teams and appointed many officials to oversee them. The sport faded in importance after the fall of Rome in the West, surviving only for a time in the Byzantine Empire, where the traditional Roman factions continued to play a prominent role for some time, gaining influence in political matters. 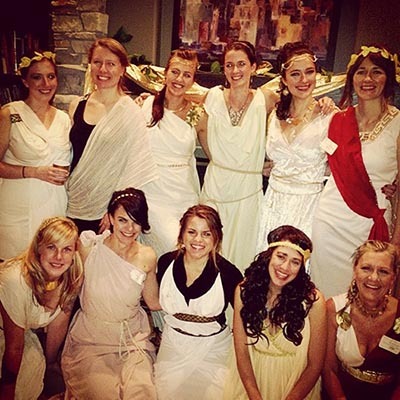 Check out these ideas and resources to set the scene for your perfect Terror in a Toga party! • Have Felix Festus (the lanista) welcome your guests to the party. 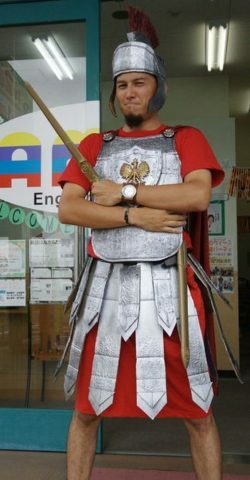 If Felix would rather focus on hosting duties, consider having Anthony Aurelius or Iovita Investigatus (and/or other soldiers) to greet guests as they enter. One of the defining characteristics of Roman or Greek culture is vine garlands and grapevine. 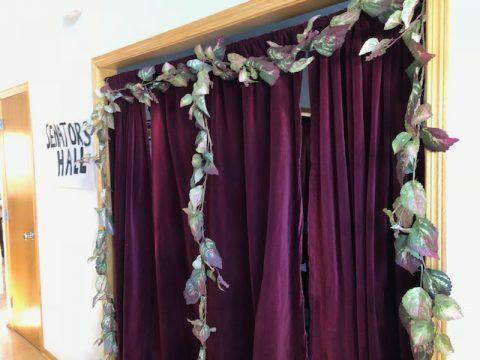 So while you have your decorations for a toga party, do not forget ivy wine garlands and have mock grape vines! Hanging floral pieces, like ivy and ferns accompanied with clear Christmas lights on the backdrop of a column will be absolutely lovely. 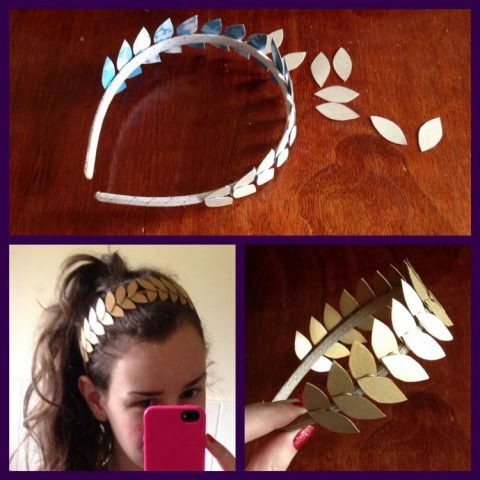 Create your own laurel wreath crowns using faux greenery and spraying them with gold paint. You can display these on the buffet table or individual tables as a centerpiece. 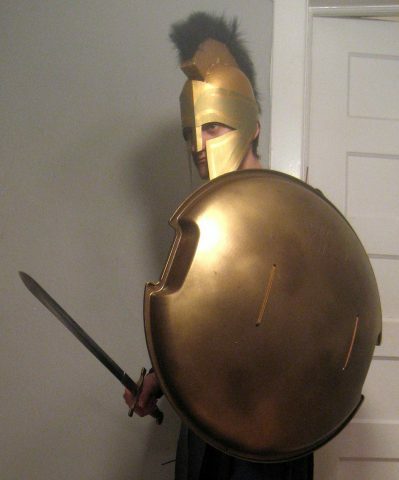 Use props, such as, classical busts, toy swords and shields. You can display classical busts on pedestals and hang a toy sword and shield on a backdrop. To make a roman bust, try taking a styrofoam wig mannequin head and cover it with white modeling clay. 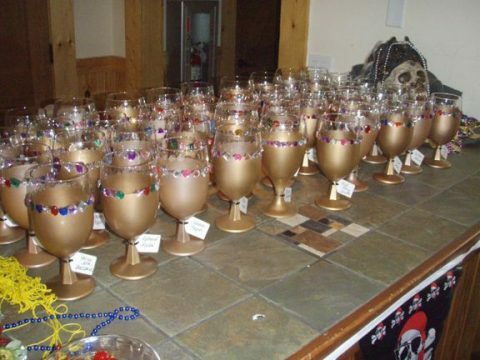 Decorate plastic goblets by spray painting them with gold and glue multi-colored plastic jewels on them for that royal effect and then display them on the buffet table or bar. HOW TO MAKE SOME AUTHENTIC ROUND ROMAN COLUMNS! 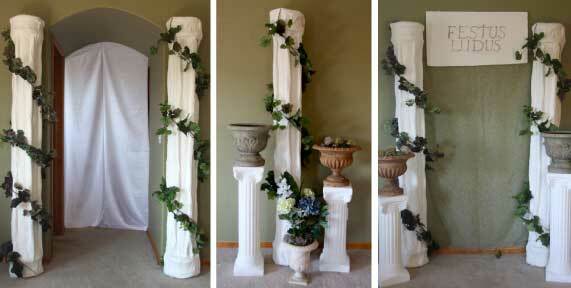 Included in your Terror in a Toga packet will be directions on how to make these fun and authentic Roman columns. 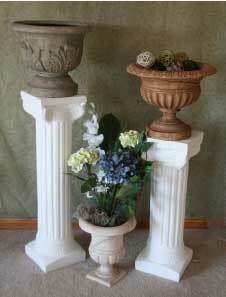 You can place them by doorways, with other pedestals and urns or to make a backdrop for pictures! HOW TO MAKE SQUARE COLUMNS! Visit your local hardware store and purchase some faux-marble contact paper, a small sand bag and enough wood tag board to construct your columns (check the discount bin). Cut the tagboard into 4 equal,rectangular pieces and nail or screw the pieces together to create a square column. Cover column with contact paper. Cut out 4 squares of tag board- 2 squares that are larger than the base of your column and two squares that are larger than that base. Cover all of the squares with contact paper. Screw your bases and tops together. Place sandbag within the column (to keep it sturdy), then screw square column to base and screw top base to top of column. A MARBLE FLOOR OR BACKGROUND: You can purchase inexpensive linoleum squares from the local hardware store (we found ours for 99¢/square) and tile a piece of inexpensive wood (check the discount bins). Your party is not complete without classical terra cotta urns and statue busts and most of all, balustrades and pedestals. To make a roman bust, try taking a styrofoam wig mannequin head and cover it with white clay. Build a chariot for Speedius Ryder to arrive in. Directions here for a chariot! If you are serving dinner, have a table set close to the ground with big pillows to sit on. As mentioned above, pick a table cloth that accentuates your color scheme. Accessorize it with complementing colors in your napkins, paper/plastic plates, and cutlery. Decorate your plastic cutlery by using a gold or purple paint pen and draw Roman numerals or a Grecian block pattern on the handles of the cutlery. Tie a gold or purple ribbon around the cutlery. For the chairs, you may want to consider adding a gold or purple bow in the back of each chair to help it blend in with the colors of the table as well as the overall color scheme. Drape gold ivy garland along the edges of each table. Don’t have gold ivy? Use your spray paint to create it. A floral arrangement makes a lovely centerpiece for your table. Place the floral arrangement inside a clear glass vase and display it inside a laurel crown wreath for that Roman touch. Display an assortment of faux fruit on the buffet table in a lovely gold fruit bowl consisting of a bunch of red and green grapes, apples, bananas, and pears. Spray paint the bowl gold or purple to bring through the color scheme. 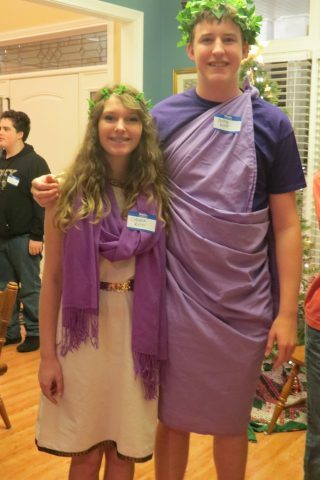 Two popular color schemes for a Roman party are white and gold or white and purple. Consider draping white or gold gossamer across the ceiling, walls, and edges of the tablecloth when decorating a large area or to make an area look more intimate and festive.. Combine two colors for a fabulous appearance. A little spray paint can go a long, long way. Spray paint novelty items, vases, old wine bottles, etc. to help bring out the color theme and add inexpensive decoration to your party. Have a tablecloth—whether plastic or fabric – the colors of your choice. Accentuate your tablecloth with the alternative color by using paint pens or fabric paint to paint on decorative Roman accents. CREATING A BACKDROP FOR A PHOTO SPOT!!! Give your guests an unforgettable souvenir by setting up a backdrop where everyone can take a picture to help remember the night! Convert a chair into a Roman throne by draping a piece of gold fabric over it, along with a piece of purple velvet for that regal feel. Make a marble background by piecing together pieces of linoleum and hanging them on the wall behind where you are photographing. 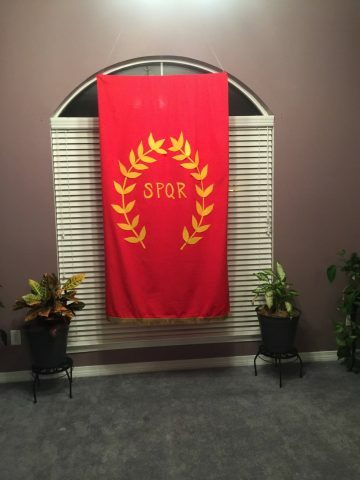 Place a few Roman columns by the backdrop. Accessories and decorations can make the difference. Have some extra props on hand that your guests can pose with. Consider extra vases, shields, swords, laurel wreaths, etc. An easy way to create a background is to use a “scene setter.” These affordable rolls of images transform your room instantly and make for a good backdrop to your picture. 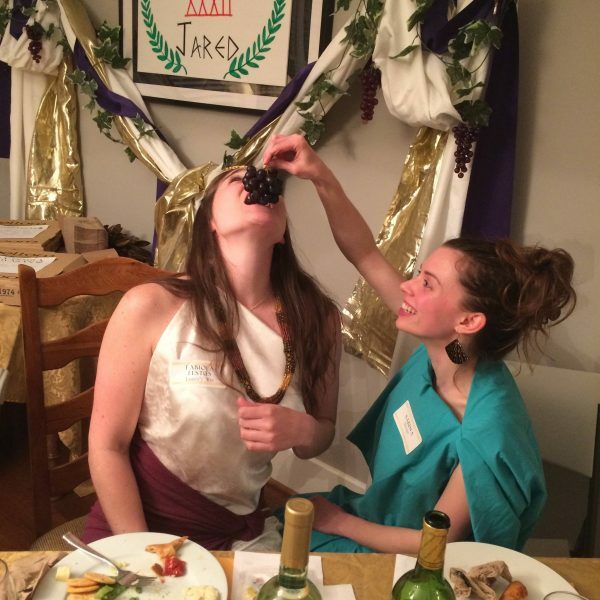 Gyros, wine, grapes, olives, what's there not to love about planning your Roman fare??? Roman meal usually began with eggs and ended with fruit. Fill gold or silver platters (can bepurchased inexpensively at a party store) with fresh chunks of cheese in a variety of colors, huge bunches of grapes still on the vine, fruits, dates, figs and nuts, and big whole loaves of bread in varying sizes. Dishes were eaten with bread —that was never absent. The Romans seemed to be particularly fond of sauces as it gave a cook the opportunity to make a dish seem a little bit more exciting that it may have been without the sauce. For heartier fare, serve chicken with figs, a phyllo spinach tart, and garlicky olives. Cover the platters with ivy vines. Serve robust wine from a terra cotta urn or golden pitchers. 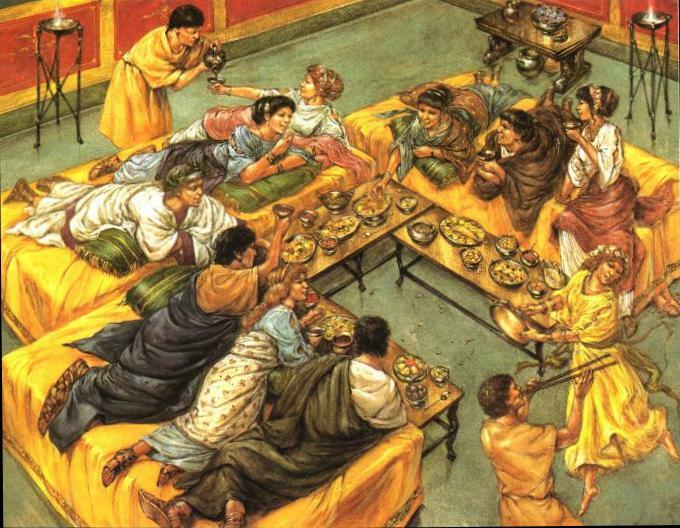 The Romans ate mainly with their fingers and so the food was cut into bite size pieces. Slaves would continually wash the guests’ hands throughout the dinner. You can place the floral arrangement inside a clear glass vase and display it inside a laurel crown wreath for that Roman touch. Also, consider displaying an assortment of faux fruit on the buffet table in a lovely gold fruit bowl consisting of a bunch of red and green grapes, apples, bananas, and pears. Play a musical compilation of lute or harp music in the background. If going all out, you could hire a harpist. If feasible, have different people take turns playing musical instruments to entertain the guests. For free musical scores, check your local library. Check out how you can go above and beyond for THIS theme!!! 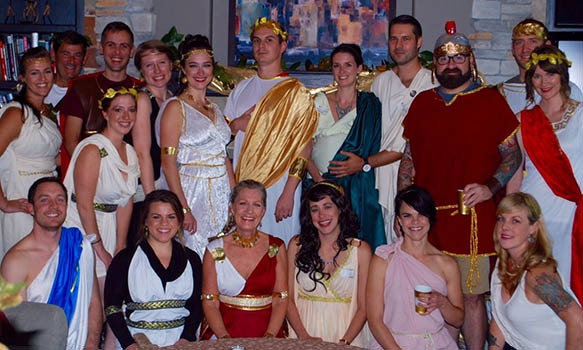 Check out this well-thought out blog on “How to Host a Mystery Party”. Although she threw Murder at The Deadwood Saloon, she has some good tips about throwing a murder mystery party. 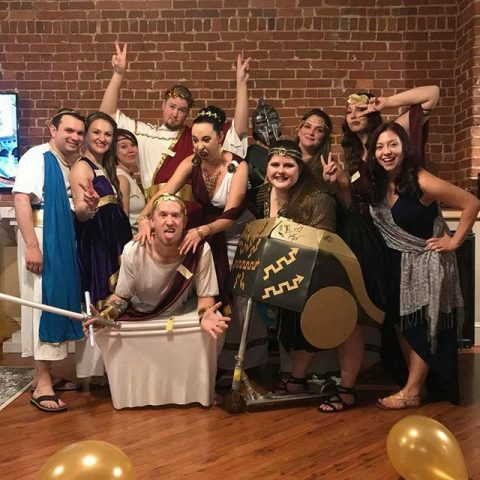 Additionally, you can always look online at our Terror in a Toga gallery to see what other hosts and hostesses have done for their parties and learn from their experience. 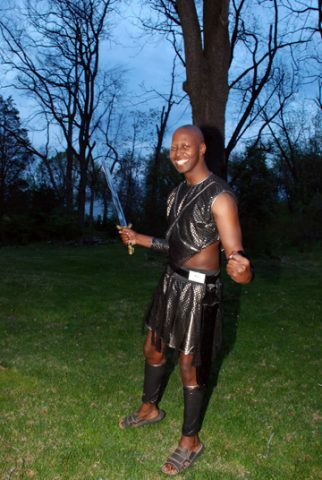 Or, check out this Terror in a Toga Party of the Month. Check out some of these movies or t.v. shows that depict ancient Roman times: Spartacus (the movie), Spartacus (Starz t.v. series), Rome (HBO series), Gladiator, The Eagle, 300, Troy, Cleopatra. Additionally, we have made a Pinterest board to give you more ideas on food, decorations, etc. Follow it to keep updated! Not to mention, when you purchase the mystery, you will receive some “Party Extra” designs and how-tos on things like making your own Roman columns, your own menus, wine labels, scroll invites and much more! 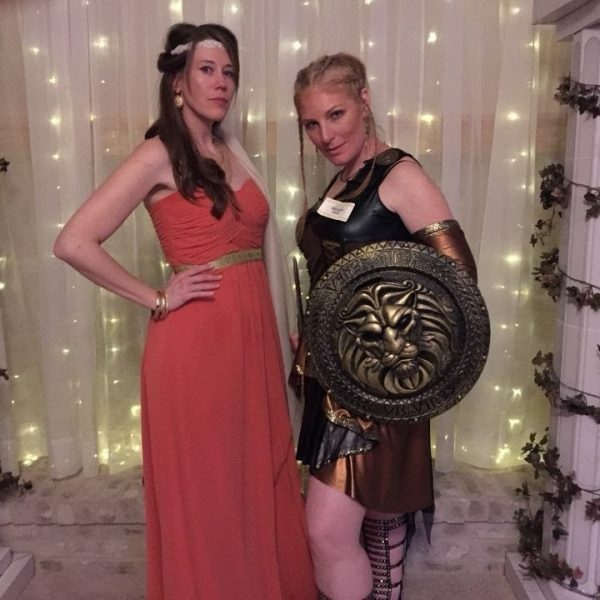 Provide an assortment of accessories to help your guests “get into character” including: laurel wreaths, sheets for togas, swords, shields, helmets, etc. You can find a number of these items on our Costumes Page. One thing that could really set your party apart is creating and delivering these scrolled invites for your guests to come to the party! Design and directions included in the “Party Extra” section of your mystery packet when you order! Included now with the Terror In A Toga Mystery packet is a number of tips and designs to help you make your own added extras! 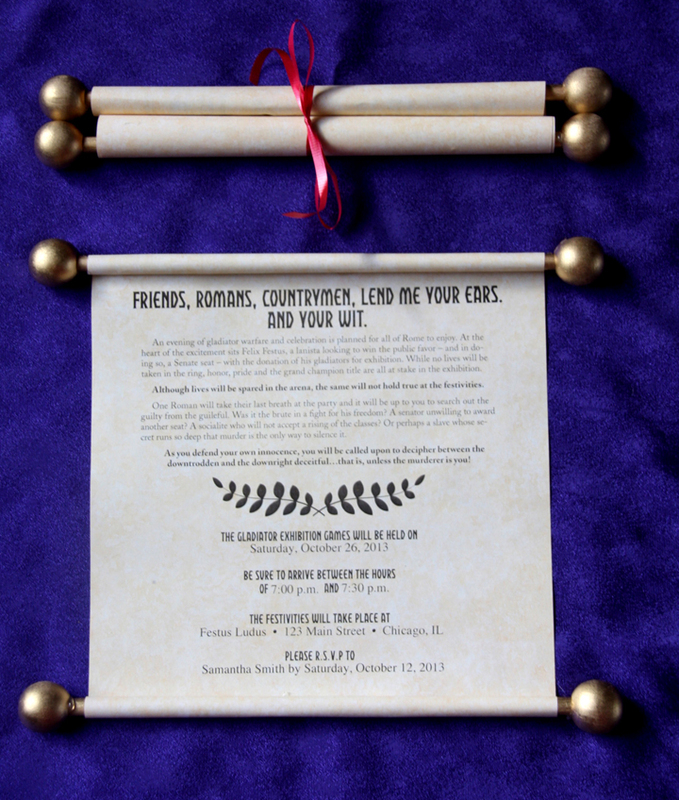 Among those are: directions and designs for making a scrolled invite, a personalized menu, roman columns, wine labels for awards, signs for around the venue and much more! Pictured here: sample menu, wine label awards and arena sign. 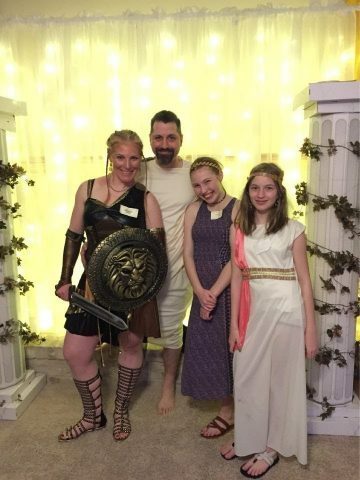 All of the information regarding how to run your Terror in a Toga party can be found online at Night of Mystery. We highly suggest that you take time to look over our website and download the Terror in a Toga preview file. Upon reading the introduction file, it will give you a better understanding about how the parties are run and what to expect once you purchase a full mystery file. 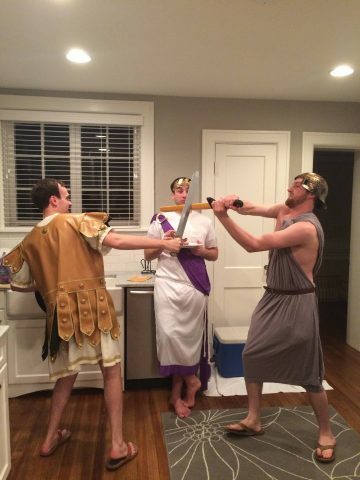 Check out our Terror In A Toga Pinterest Board! 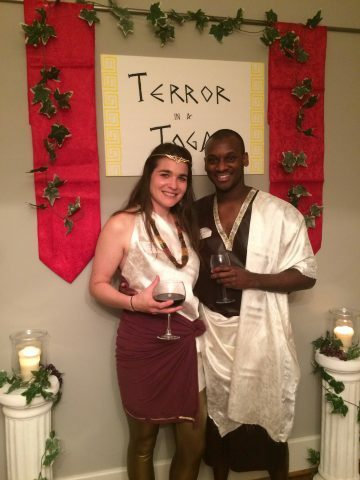 For even more party planning ideas, check out our Terror In A Toga Pinterest Board here. It is s filled with ideas for recipes, costumes, decorations, etc. 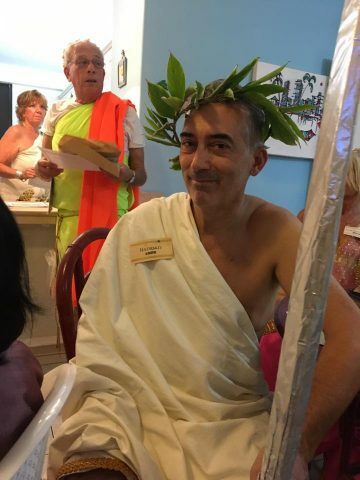 for the perfect error In A Toga party! Included now with the Terror In A Toga Mystery packet is a number of tips and designs to help you make your own added extras! This was an awesome experience, with all the trimmings...mostly pizza and different breads and oils. I wish we were wine drinkers but we went with ale. This was our first murder mystery and it was a ton of fun. After the murder, the victim's love interest did an excellent job selling the drama with fake tears and a sorrowful sobbing. It was hysterical and the highlight of the night. The victim was given an additional character to continue playing. We had great fun and cannot wait for the next big night when we have a Knight of Murder. We had so much fun for my birthday! 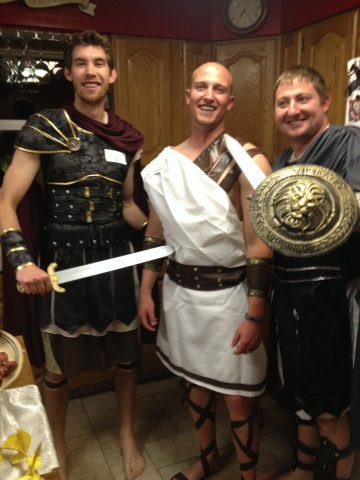 We did the Terror in Toga theme and everyone played the part! We had a sit down dinner and even got a chef to make it more unforgettable. At first I was unsure how everyone was going to partake, but everything and everyone fell into place and played their roles. We can't wait to do it again! We just hosted this mystery last night and it was a blast! We had 20 people. 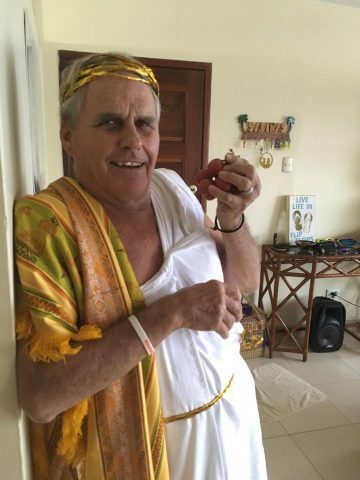 Everyone had great costumes and everyone really enjoyed getting into character, except maybe the slaves because the senators kept making them fetch grapes haha. We even had a challenge break out between Gladiators Brutus and Hadrain take place in the Arena! All around this mystery dinner made for some great fun and a great night. Thanks to the Night of Mystery guys for making such great mysteries! We'd making mystery dinners and annual event now! We threw the Terror in a Togo Murder Mystery party in celebration of my boyfriends 34th birthday. It was a perfect way to celebrate and all of the guests were very impressed with the content of their characters and organization of the event. My best friend Katie threw me THE BEST 30th birthday ever! I recently got invited to another party causing me to go back and reminisce about the fantastic time that we had. The mystery went off without a hitch and everything not only looked "killer" they had a wonderful time playing their parts. Almost too much fun because only one of us was able to figure out who had done it! The characters were unique and clever allowing us all to engage with each other at different points in the game. I love that I had the opportunity to get my crew together (All 14 of us!) for some laughs, adult dress up and one awesome mystery. Thank you Katie and Night of Mystery for making this possible!